SHOROC President Cr Jacqueline Townsend has welcomed the major $400 million underpasses and upgrades planned for Warringah Road outlined in the next stage of planning released today by the NSW Government. “These upgrades are great for the community as they will cut travel times for residents and businesses travelling on Warringah Road, Wakehurst Parkway and Forest Way and help reduce road congestion across the entire region,” said Cr Townsend. NSW Roads and Maritime has released further detail on the planned upgrades and is planning a series of community information sessions in conjunction with NSW Health and councils on the plans. The NSW Government is also working to address flooding issues on Wakehurst Parkway and will ensure access to the hospital for all residents across the Northern Beaches. “We have been working productively with our local MPs and Transport for NSW to develop an integrated transport plan for this region. The results speak volumes for the benefits that can come from a strong state and local government partnership on a regional level. “We look forward to working with the NSW Government to deliver the road and public transport upgrades this precinct and the whole region needs,” said Mayor Townsend. SHOROC encourages the community to visit the upcoming community information sessions in July and August to find out more. Details of the sessions and full detail on the plan can be found on the RMS website. • Saturday 16 August 10am-2pm at the Manly Life Saving Club, Manly Surf Pavilion on the corner of South Steyne and Ashburner Street at Manly. 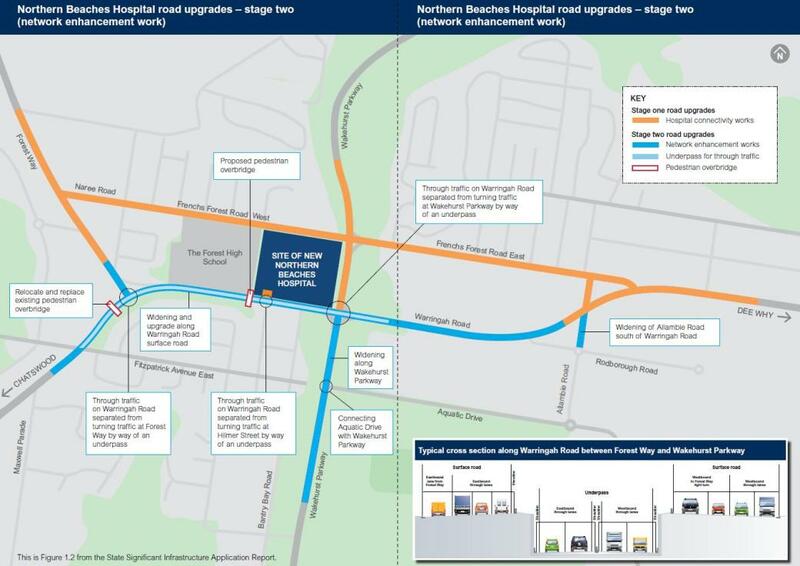 An excerpt from the announced plans showing the Warringah Road underpass. Click here for a closer look.